Judging by the pics, I'd say 1". It's gotta be more than 1" I would hope. Whats makes you think it would just be one inch? 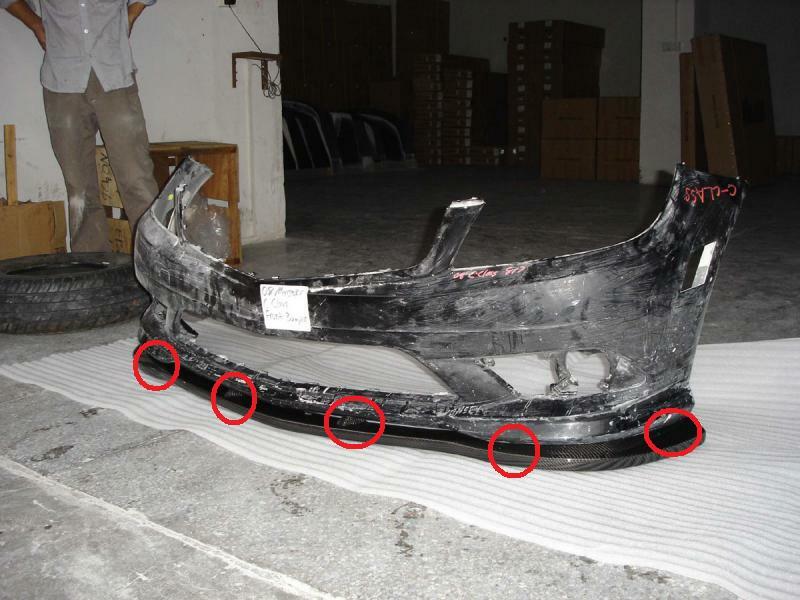 Well from the original pics, it looks like it is form fitted to the bumper on either side. The center of the front bumper is also higher than the sides, so the bumps really just push it out to match the sides. Because of that form fitting side, it gives the illusion that it is lower than it really is. That bulge you see is more the lip than the bumper. It's not attached to the bottom of the bumper like splitters. I'm probably wrong haha! I'm guessing here by the pictures provided. Depends on whether or not the car they are using has a drop kit on it. It looks, to me, like it's probably 2"+ from the ground with the lip installed. I'm guessing about 3-4 inches. By the way is the price going to remain the same? Or is this just an introductory price? I'm probably going to get this lip around summer time because I really shouldn't be modding anymore right now....haha.. Trying to meet up a potential test fitter this Saturday. still not a great picture but you should have an ideal how it looks like on your car. What are you waiting for? Be the first!! I'm really considering it. Walnut isn't THAT far away either....but I really shouldn't be modding anymore for now. Gah. So just wondering again, I don't think we ever saw a response. How is the lip secured? $260 shipped for that? I'm in! do you still need test on car? I live in La Habra,ca about 16miles away. how long does it take to test fit and do all the things? By looking at that picture the fitment looks very good. $260 shipped. I have 3 left. Paypal to [email protected] and part# is W204CFLIP also include your phone # for shipping purposes. Thanks! We don't need a car to test fit anymore but they are still for sale $260 shipped or $200 cash for local pick up. I notice there a gap in the middle of the bumper. Will this lip hold on high speed with all that air going against it. That is what I am worrying about. I will check it out and most likely buy it if there is not fitment issue or if the car doesn't get too low. I Will let you guys know, on Tuesday. This was my first lip.. In ABS though. When it first came out, the fitment was terrible. Let's hope it's symmetrical now. How about some pics fully installed with a full frontal? Also from a distance. I remember that what I didn't like was how the lip angled from the front of the car showing practically the whole bottom of the lip. Also, there will be 6 holes that you can see if you end up removing the lip later on.